I love boudin. I’ve loved boudin ever since I was a kid. My father’s house was right near a great little convenience store/meat market that sold EXCELLENT boudin. I’d head there anytime I was visiting for a few links of boudin for lunch. Boudin resembles sausage, but the filling is a mixture of rice, pork, peppers, onions and spices. Sausage casings are filled with the stuffing and then heated (usually steamed in a rice cooker) and served warm. You can also buy boudin frozen, thaw it and re-heat the links at home. It’s typically sold by the pound, but comes in links (very similar to sausage). Boudin balls are basically the filling of boudin sausage, rolled into a ball, battered & deep fried. That’s it, I was sold. You don’t even have to get down out of your car? SIGN ME UP. Pepperjack stuffed boudin balls – see the delicious cheese in the middle? That’s yummy in your tummy. I’d also heard that there are always lines of people waiting to buy these pepperjack boudin balls, so I went prepared to wait in line. 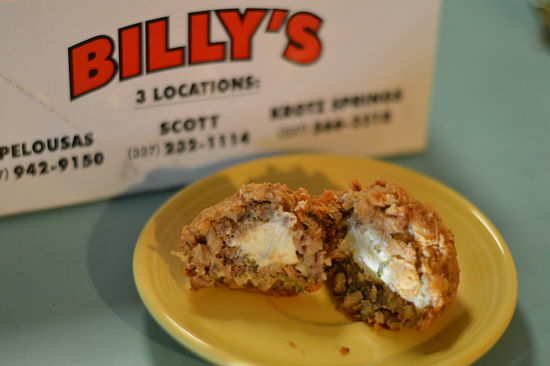 When we went to Billy’s during Christmas break to get our pepperjack boudin ball fix, we waited in line for 30 minutes or more – the line was wrapped completely around the interior of their store. The bonus for them is that folks had plenty of time to shop while they waited for their turn at the counter to place their order. I answered questions as we waited. One woman picked up some pre-made gumbo mix in a jar and read the directions that referenced a “gumbo pot”. She said “What’s a gumbo pot?” I explained to her that a large stock pot would suffice. I love our culture. We have our own way of relating to one another and I really miss that. I’m sure you’ve figured out that she was visiting from out of state, it was her first time in Louisiana. 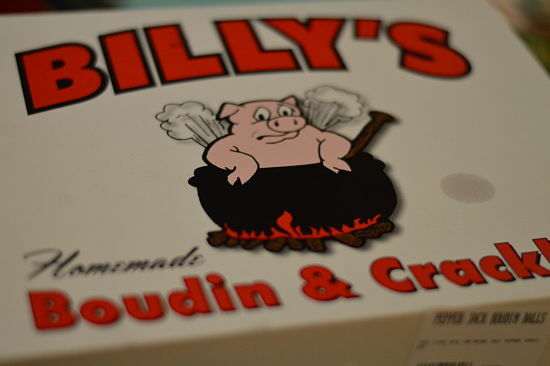 I would like to add that their smoked boudin is amazingly delcious, too. It’s a toss up as to which I love more – the pepper jack boudin balls or the smoked boudin, get a little of each and decide for yourself. Go early to beat most of the crowd. Boudin balls for breakfast – why not? Be sure to ASK for the Pepperjack boudin balls – they do have regular boudin balls, but after waiting in line for that long, don’t make the mistake of going with the plain ones – splurge for the pepperjack – trust me, you’ll love it. Get a link of smoked boudin – it’s amazing. What’s your favorite obscenely delicious food? Fried twinkies? Fried oreos? Share your favorite delicious treat below.